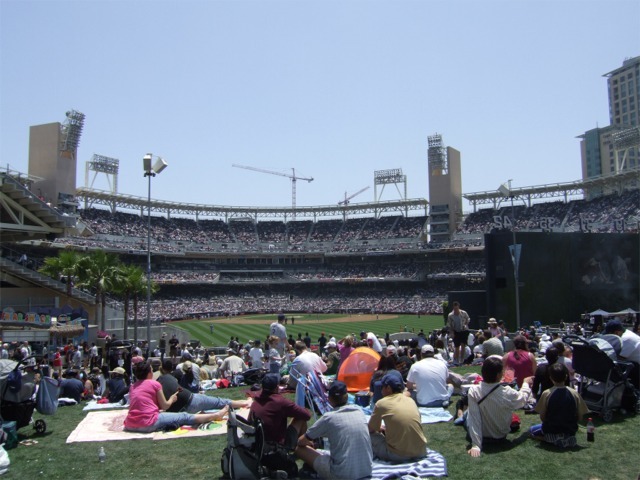 Since 2004, Padre fans have had one of the best ballparks to watch games and create new memories each summer. 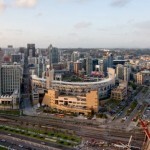 However before Petco Park’s opening, that was not always the case. 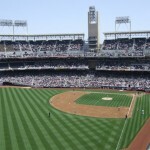 With an aging Jack Murphy Stadium and having to share it with the San Diego Chargers (NFL), the Padres needed a ballpark of their own. 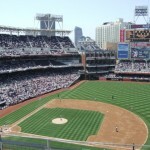 Larry Lucchino, who helped the Orioles build Camden Yards, became President of the Padres in 1995 in part to help the team get a new ballpark constructed. 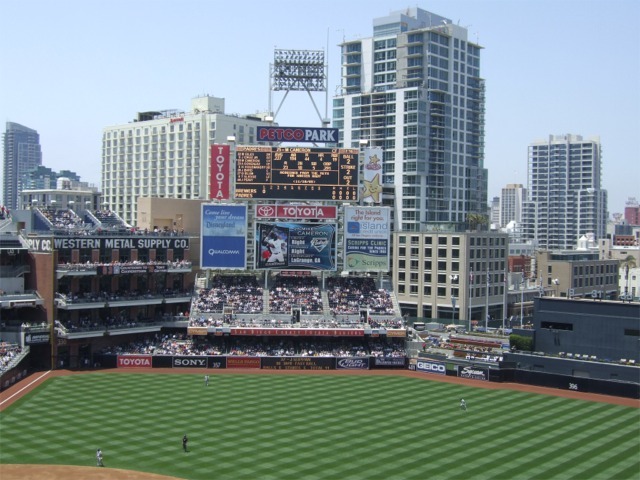 In 1996 the club officially announced plans to build a ballpark and after making it to the World Series in 1998, the voters of San Diego approved a bond to allow construction of a ballpark in downtown San Diego. 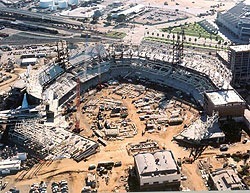 Originally, the 42,445 seat stadium was scheduled to open in 2002. 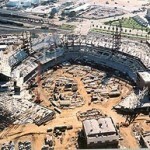 However, in October 2000 funding for construction of the ballpark ended and was halted for more than a year. 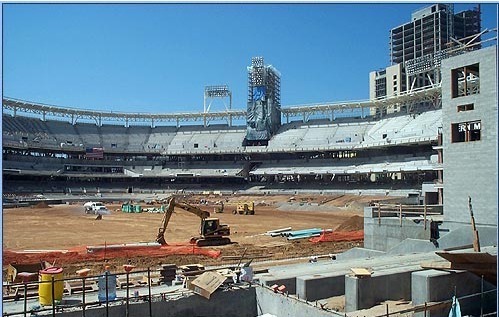 Over a year later in November 2001, the City of San Diego approved a $166 million bond in order for construction to resume. 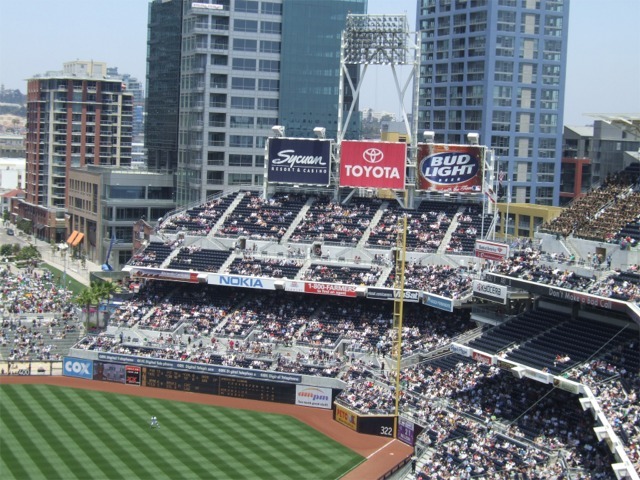 In January 2003, Petco Animal Supplies, Inc. purchased the naming rights for $60 million over 22 years, thus the ballpark was named Petco Park. 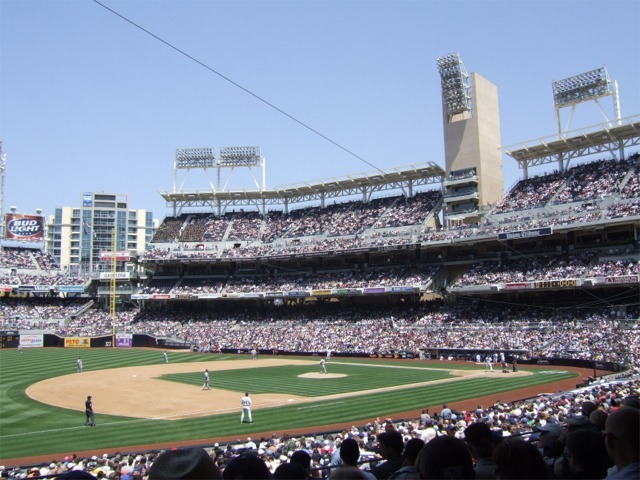 On April 8, 2004 the Padres played their first game in a ballpark they could truly call their own against the San Francisco Giants. Gone are the days when they had to share a stadium with another team. 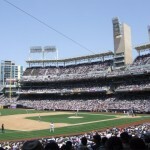 The $411 million ballpark has a Southern California appearance with its white steel and sandstone facade with palm/jacaranda trees placed along the perimeter. Leading up to the entrance of the ballpark, fans pass by a palm court and water walls. 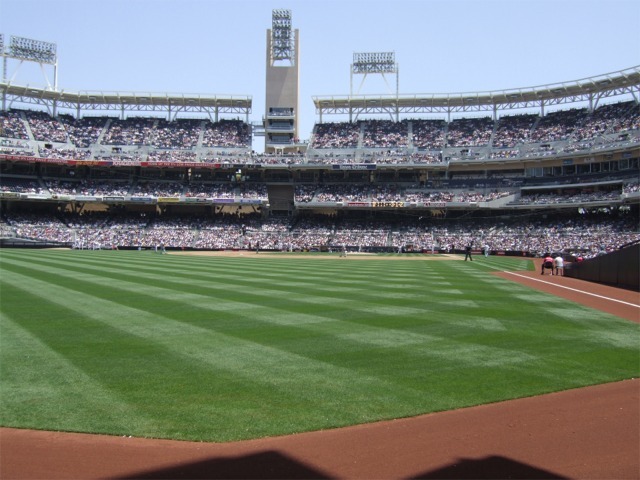 Once inside the ballpark, all fans have an excellent view of the grass playing field. 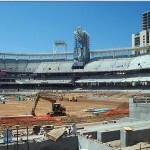 All of the 42,500 blue seats are close to the field and are angled toward the pitchers mound. 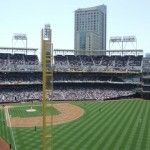 The three tier grandstand extends from the right field foul pole around to homeplate and to the left field foul pole. 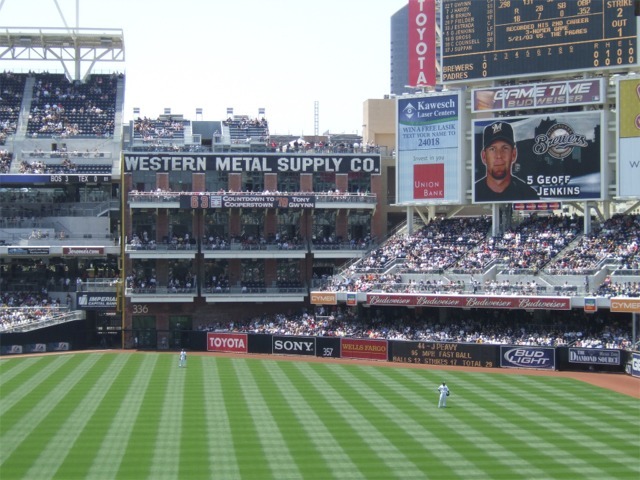 At the left field foul pole is a San Diego landmark, the Western Metal Supply Building is part of the left field wall and foul pole. 300th homerun on August 16, 2004.
becomes the first pitcher to record 500 career saves on June 6, 2007. Cy Young Award winner Jake Peavy in 2007. 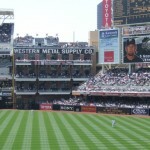 The Western Metal Supply Building houses the team store on the first floor and has an opening to allow fans into a standing room area in left field. 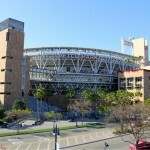 Located on the second and third floors of the building are party/luxury suites, with a restaurant on the fourth floor. 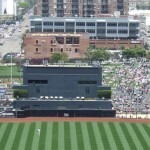 Located on top of the building are 800 bleachers that provide tremendous views of the ballpark. 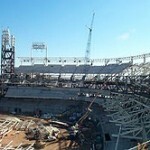 These bleachers can be retracted in order for the area to be turned into a party area for fans. 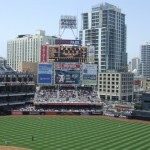 The main scoreboard sits above the seats in left field. Another scoreboard makes up part of the right field fence. 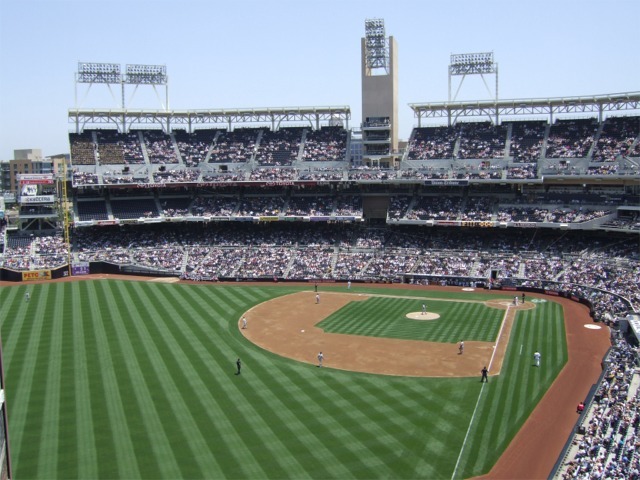 Additional seating can be found above the right field wall where there are two levels of seating. 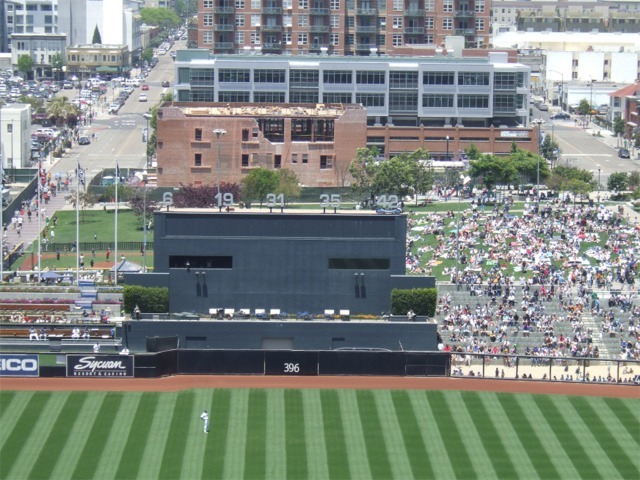 Directly behind the centerfield fence is the Padres bullpen and a new two-level “social space,” inspired by San Diego’s beach lifestyle is in right-centerfield for 600 fans. Added before the 2016 season, it’s located where “The Beach,” a kid’s sand area was once located (now located along K Street). Modeled after Southern California’s beach piers, the new space features pilings and decking constructed from recycled composite wood. Drink rails will line the front row of both levels, which will combine to hold approximately 60 fixed seats. 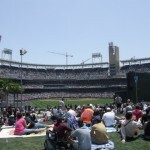 Directly outside the ballpark behind the centerfield area is the “Park at the Park.” This elevated grass park is a manicured park that is used for lawn seating. Here fans are able to watch games for five dollars. 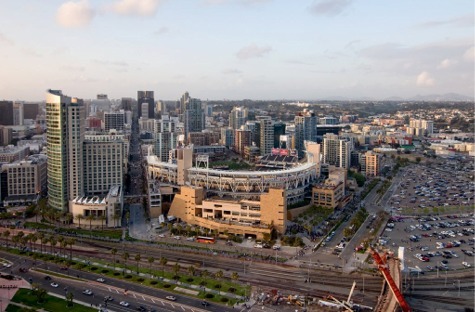 Although some of the best views of the ballpark may come from this area, the view of the ballpark and downtown San Diego from the upper deck behind home plate are spectacular. Several unique 200 foot towers supporting the grandstand and extending above the main grandstand support the lights for the playing field and house luxury suites and lounges. 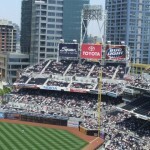 A Padres Hall of Fame, 250 seat auditorium, kids entertainment zone and theater are also located at Petco Park. 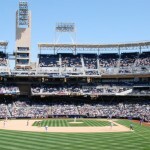 Fans of all ages enjoy coming out to Petco Park for some fun and exciting Padres baseball. 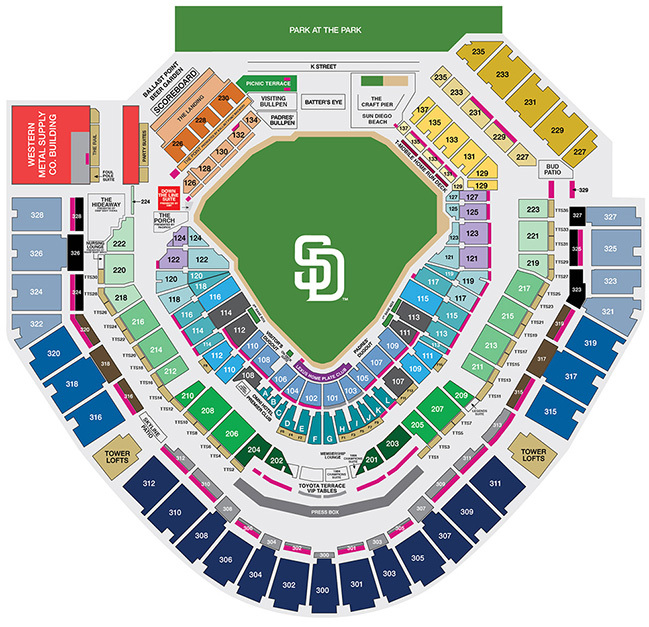 In an effort to make Petco Park less of a pitchers park, the Padres changed the dimensions before the start of the 2013 season. 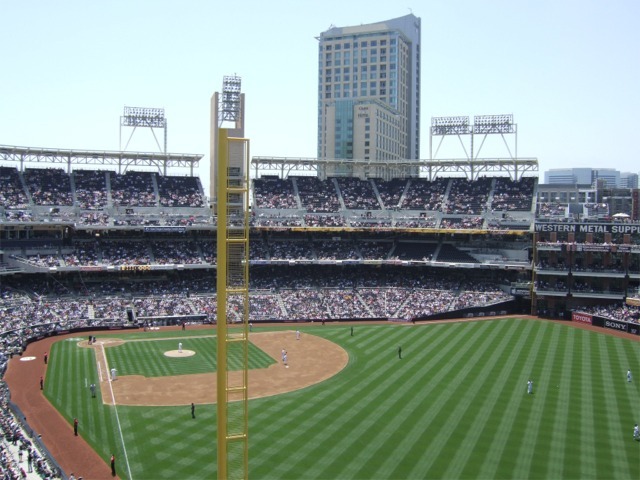 The dimensions to the right and left field foul poles and to centerfield remain the same but the distance to the left field power alley decreases from 402 feet to 390 feet and the right field foul pole from 402 feet to 390 feet. 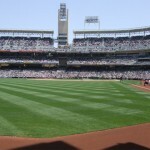 The team also moved the visiting team’s bullpen from down the foul line to behind the Padres bullpen. Before the start of the 2015 season, the old videoboard was replaced with a new HD videoboard that measures 61.5 feet high by 124 feet long. 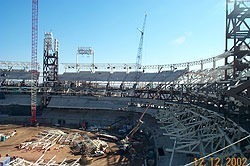 Below the videoboard, the last nine rows of seats were removed and replaced with open spaces for groups. In addition, 110 seats from the lower bowl below the scoreboard were removed creating a standing room only area with bar stools for fans. 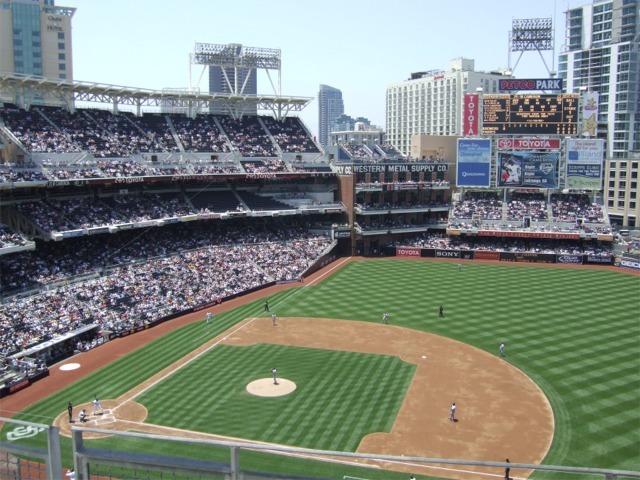 The project only slightly altered the seating capacity of Petco Park. 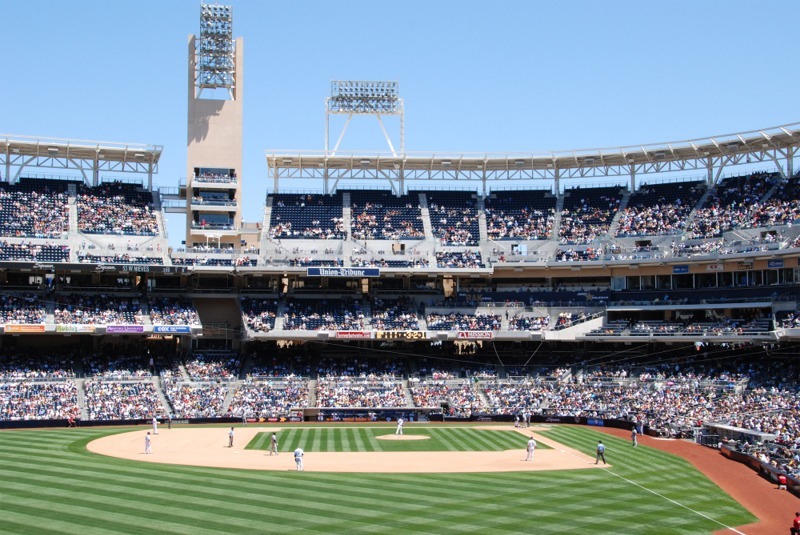 In 2016 the Padres opened their first Hall of Fame at Petco Park. 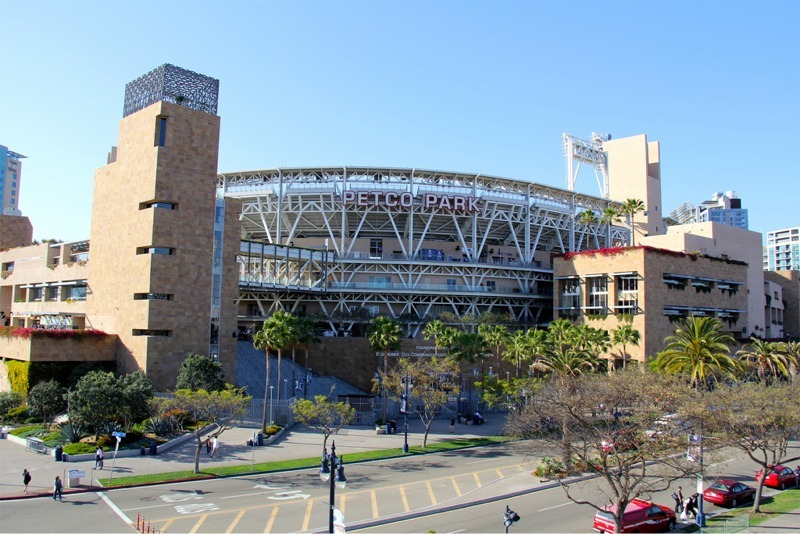 Located beyond the left field wall, just inside the ballpark gate, the Padres Hall of Fame celebrates the history of its minor and major league history. 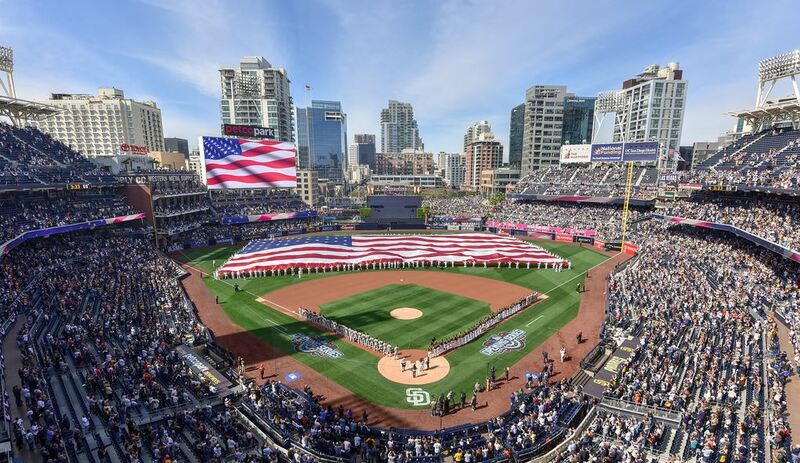 On July 12, 2016 San Deigo hosted its third MLB All-Star game and the first at Petco Park.